New England boxers dominated last night’s Broadway Boxing, presented by DiBella Entertainment and sponsored by Nissan of Queens, Optyx, Azad Watches and Christos Steak House, held in the Fox Theater at Foxwoods Resort Casino in Mashantucket, Connecticut. 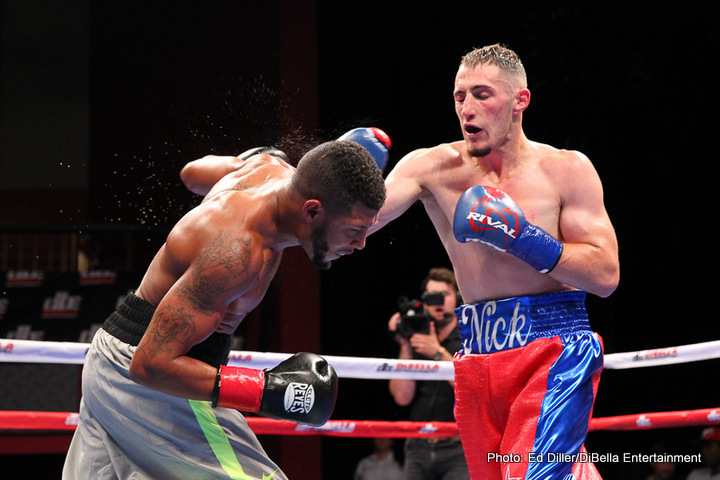 Rhode Island lightweight “Nice” Nick DeLomba (11-1, 2 KOs) outboxed and outpunched former Florida State Golden Gloves champion Amos “2 Smooth” Cowart (11-2-1, 9 KOs) for an upset victory by way of an eight-round unanimous decision. DeLomba, who was one of five winning New Englanders without a loss, took the fight to Cowart, beating him to the punch and effectively counterpunching. Cowart was unable to contain DeLomba’s side-to-side movement or his flurries of punches in the main event. In the co-feature, New Mexico super featherweight Jose “Shorty” Salinas (10-2-1, 5 KOs) stood tall, stunning Albania native Dardan Zenunaj (12-2, 9 KOs), who is trained by Robert Garcia. Now fighting out of Belgium, Zenunaj couldn’t put Salinas away early and he paid for that in the later rounds. Bloodied and bruised, Salinas refused to stop throwing punches, and his huge heart resulted in an eight-round unanimous decision victory. Undefeated Spaniard Jon “Jonfer” Fernandez (9-0, 7 KOs) used a tremendous height and reach advantage to pound his tough Mexican opponent Naciff “Chata” Castillo (17-9-2, 5 KOs) until referee Joey Lupino halted the action midway through the fifth round. Fernandez recently signed a promotional contract with DiBella Entertainment and legendary boxer Sergio Martinez. Brooklyn lightweight Wesley Ferrer (12-0, 6 KOs), a 2013 New York City Golden Gloves champion, kept his undefeated record intact by outclassing a game Angel Figueroa (4-4-1). Referee Arthur Mercante stopped the fight 20 seconds into the seventh round. Sensational high school senior “Marvelous” Mykey Williams (4-0, 2 KOs) unloaded a three-punch combination that knocked out David Nelson (3-6, 1 KO) just 24 seconds into the first round. The 18-year-old Williams, fighting out of East Hartford, is rapidly developing into a rising star. Worcester, MA featherweight Irvin Gonzalez (2-0, 2 KOs) needed only two minutes to knock out Juan Muniz (0-5). The 20-year-old Gonzalez, whose pro debut also ended spectacularly in the opening round, exploded with a barrage of punches until referee Mercante stepped in to save the Texan from additional damage. In an action-packed match between a pair of pro debut fighters, East Hartford welterweight Anthony Laureano (1-0) emerged with a hard-fought win by four-round majority decision over Philadelphia’s Nahir Albright (0-1). The 21-year-old Laureano was a 2016 New England Golden Gloves champion. Fan favorite Jonathan “Smooth” Figueroa (1-0, 1 KO), fighting out of nearby Hartford, turned in an impressive performance in his professional debut, finishing off Philadelphia welterweight Demetris Williams (0-2) in the fourth round. Figueroa, a 2012 Southern New England Golden Gloves champion, wore down Williams and ended things with a powerful right hand.